Cooking and love of food in my family goes way back. I think the first time I remember being in an institutional kitchen was in the Polk County Stockade in the ’60s. I know me being in a cell doesn’t surprise anyone that knows me, but in the ’60s?? I was born in ’61, so did I start my criminal record before my 10th birthday? No, not exactly, I am named after my grandfather, John Washington Senn, and everyone in Bartow called him Capt. Jake, as he was the warden of stockade. Granddaddy died when I was 7, but before that, I spent many a day in the stockade as Little Jake, the pride of my grandfather. I had the run of the place because none of the prisoners wanted the wrath of Capt. Jake if anything happened to Little Jake. So I could go anywhere, do anything. Granddaddy LOVED oyster stew. His family was from South Carolina – one of the reasons I went to Clemson for college – and oyster stew on Christmas Eve was a tradition he passed down to his daughters, and they have passed down to us. Every Christmas Eve we’ve had oyster stew for as long as I can remember. The last 20 years it’s been a lot easier because mom has a great source for fresh shucked oysters! It was a natural menu item at the Oyster Bars to put my grandfather’s favorite soup (meal) on our menu. We had mom tweak the recipe (it is so easy – shhhhh) to be able to prepare it to order, so it’s fresh, and the oysters aren’t overcooked and rubbery from sitting on heat too long. 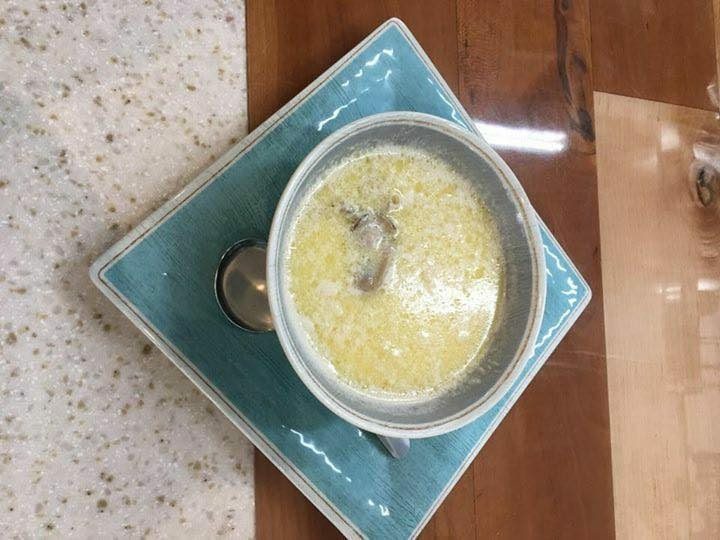 I’m not sure if you’ll want to rush down to get a bowl of oyster stew after you see recipe or swear you’ll never eat it because of the amount of butter. Look at me – you can tell my choice. Only thing it’s missing is bacon! So from granddaddy to mom to me to you, here’s the recipe. Try it at home cause it’s easier than you’d think. If you need us to come by and taste test, we’re always available or stop by any of the O-Bars, even on the pier, and order a bowl for yourself. Now you know the story behind the menu item. Place butter, cream and oyster liquor in skillet and bring to slow boil. Cook for approx 4 minutes, letting cream reduce. Reduce heat, add oysters and cook for 1 minute. Serve in a soup bowl.